JP Morgan, reported on iPhone growth, which is driven by: 1) new subscribers; 2) incremental consumer switching to iOS; and 3) replacement units from existing iOS users making it to the secondary market (Apple has ~50% share of the secondary market relative to 15% of new smartphone market). 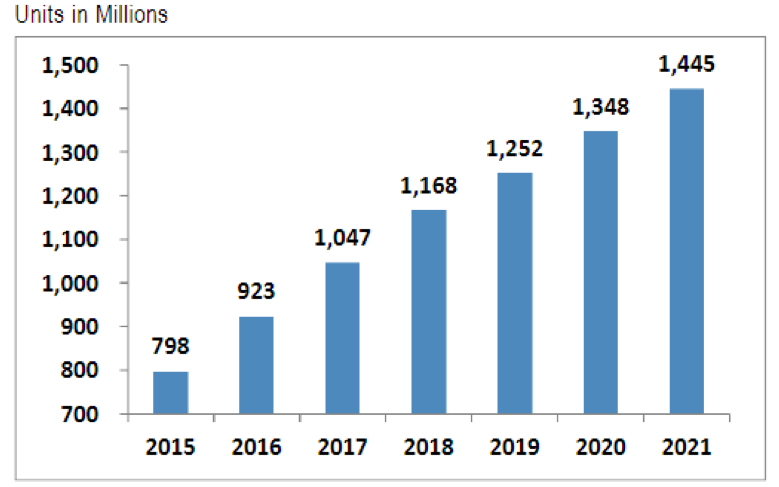 JP Morgan estimates that the total installed base in 2017 reached 1.4b devices (including ~1b iPhones) and forecasts the total installed base at 1.9bn by 2021, corresponding to 7% CAGR. ​One of the reasons that the class action case is so important is that services are becoming a larger share of Apple’s revenue growth. Between 2012 and 2017, Services revenue contributed by 20% ($17 billion) to total revenue growth ($73 billion) while iPhone sales contributed by 74% ($63 billion). With the growing installed base, services are expected to continue to grow by at least 20% per annum.